Zentangle: Morning Zentangle and . . . When Maria started out on this tile she didn't like how it was going, but she kept on and I'm glad she did. 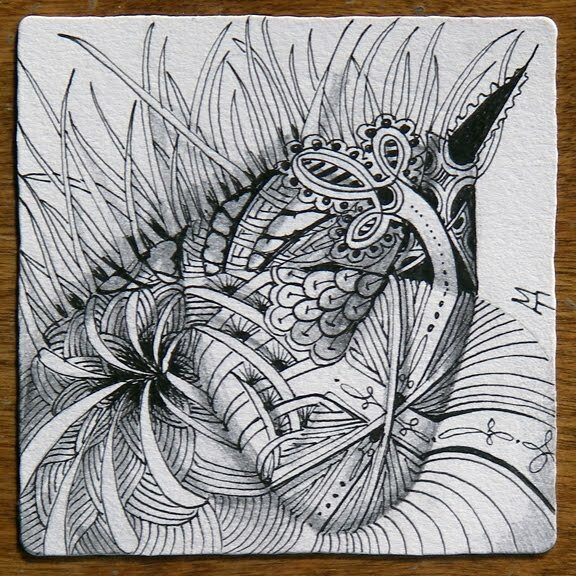 Thanks to "Little Pug Design" in Melbourne, Australia for this blog post on Zentangle. We particularly wanted to share this paragraph. Zentangles are the brainchild of Rick Roberts and Maria Thomas - they've brought together and solidified ideas that have been floating around the art world for centuries and made it into something meaningful and legitimate. Thanks for that, Kass. Your few words describe so succinctly what we had in mind when we created Zentangle. We look forward to meeting you. you are welcome Rick and Maria, I am defintiely coming in October!! I can't wait! !